As a digital marketer, creating the perfect inbound marketing proposal is the difference between the client jumping onboard, or missing out on the deal. Inbound marketing strategies focus on attracting your client's customers through useful content on various digital platforms. Whether you opt for templates or you plan to draft the document from scratch, there are crucial elements that have to be discussed if you endeavor to be successful. So, what does the inbound marketing proposal need to convince the potential client that you are good at effective digital marketing? You need to address your potential client's current digital marketing situation. The situational analysis allows the client to see that you can offer a highly scalable platform that is focused on acquiring and retaining new market segments. Without such a focused strategy, your potential client is bound to experience slow growth, and they risk losing potential customers to their competition. You need to address these issues through an inbound marketing proposal with a robust marketing plan that will help them realize their goals. So how do you know their goals? You need to research deeply into your potential client's current business, the environment, their products and the type of customers the products are designed for. Reach out to them to understand what uniquely drives their business. This segment is your opportunity to discuss how your experience and background will help the potential client achieve their goals. Use this segment to explain how you plan to acquire and retain customers. Discuss the key market segments that are essential to the potential client (market segments like events and conferences industry, retail and e-commerce, educational institutes and influential media). Remember that inbound marketing starts by creating content that will attract these potential customers. Explain how your approach will use earned social media platforms to funnel potential clients towards your client's site. If you plan to use educational content to create a supportive culture, make it clear here. Also, you can explain how you plan to recognize and reward users for inviting their contacts to the client's site. Explain how you will position the client in search engines through SEO strategies. Identify strategic partners in key sectors and explain how you will develop messaging platforms whereby these strategic partners will be able to connect with your client. 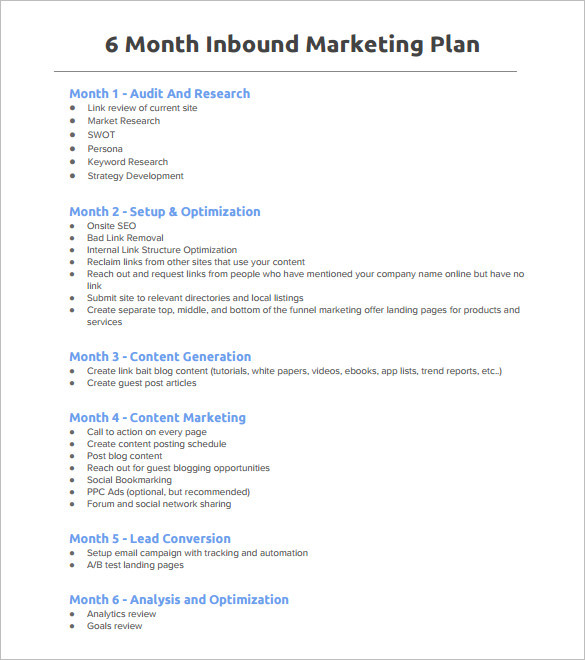 This section of the inbound marketing proposal is meant to handles the schedules for the key strategies outlined in the previous section. Thus, you will describe suitable deliverables on a month-to-month basis, or for smaller projects, week-to-week timelines. It is prudent that you outline the expected time that will be required for your client to realize their desired goals through your strategies. This section will outline to the potential clients the leadership teams. Thus, it's prudent to describe the skills, qualifications and work experience of your top leadership team. This approach instills more confidence that your company has what it takes to handle the digital marketing needs the client may have. This section breaks down the total cost of the project, outlining individual fees and expenses for implementing the plan. Make sure the breakdown is done in a well-structured manner that indicates the expected costs after each milestone. This segment deals with specifics on issues such as payment schedules and channels, late fees and interest accrued as well as terms of cancellation of the contract by both parties. 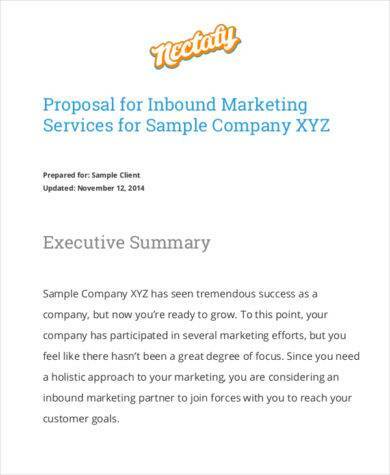 The inbound marketing proposal is meant to be tailored individually for each prospective client. Resist the urge to make any of your business proposals generic.